Shearing for 2019 will be April 18th & 19th and May 3rd & 4th beginning promptly at 8:00 a.m. until about 5:00 p.m. With 200+ alpacas we need a minimum of 4 days and sometimes include a 5th day. There is a lunch break and two or three short breaks. Plenty of snacks and liquids are provided throughout the day. Our master Chef Joe offers breakfast, lunch, snacks and dinner to our crew. Shearing is physical work, but with the right group of workers it always includes plenty of laughs. Our shearers are professional, gentle, quick and efficient. 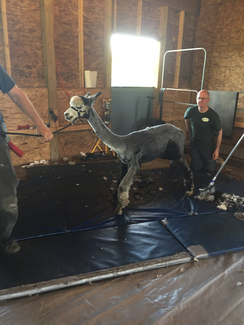 Our alpacas are handled with care during the process. Chuck and Elaine Gerber of Woodland Meadow Farm will be shearing for us in April. With a small team of volunteers the Gerber's will have our boys looking stylish. We appreciate their hard work, skill, patience and good humor. Our boys appreciate them also. In May, we will have Shear Relief, a group of 4 talented individuals and a few volunteers will have our girls, yearlings and juvies looking marvelous. We shear our crias at the end of July for our Spring births and another shearing in September for our summer crias. Any crias born after September 15th will not be shorn until the following Spring. During shearing, each alpaca has an all over health check and spa day. We trim their teeth, nails, top knots and tails. 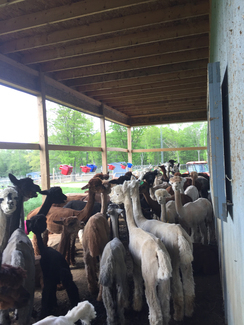 The age and fiber growth of each alpaca is assessed to determine if that alpaca will be shorn. Some older alpacas (16 and above) do not produce fiber the same as when they were younger. If an alpaca has a short staple length, or lacks density we may opt to not shear the entire alpaca. In this instance we (the shearers) will only shear the belly area, this helps the alpaca to cool down when provided with shade, sprinklers and plenty of drinking water. I also take this opportunity to administer their monthly Ivermectin shot and any other meds or vitamins that may be due. This also is the time when we can fully enjoy the beauty of their fiber as it rolls off their bodies, bright, and soft in a variety of 22 colors/shades. 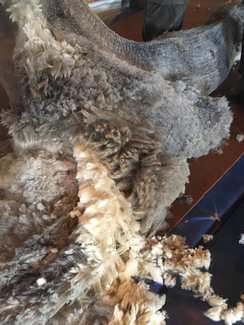 First we collect the prime fiber (the blanket), then the 2nds which include the neck and upper leg, followed by the 3rds - lower leg and apron. Each collection is individually bagged (or noodled), and identified with name, shear date and weight. The weight is used as part of our analysis in production data. Some of our blankets are pre-purchased to individuals that work with fiber for their own end use products or production. We will send some of our fiber to a local mill for processing into yarn which we sell at markets, our shop and soon to be on line. Some of the yarn is hand knit by local knitters or myself. The bulk of our fiber is sent to the New England Alpaca Fiber Pool for end products or sold as raw fiber. We keep a few bags for making dryer balls. We also use the scraps that do not make it into the bags as 4ths in our garden as mulch. Needless to say we put our yearly clip into production. All volunteers and watchers are welcome. Please do not bring your pets as they add unnecesary stress to our herd and LGDs.